It was now almost time for the Jewish Passover celebration, and many people from all over the country arrived in Jerusalem several days early so they could go through the purification ceremony before Passover began. They kept looking for Jesus, but as they stood around in the Temple, they said to each other, "What do you think? He won't come for Passover, will he?" Meanwhile, the leading priests and Pharisees had publicly ordered that anyone seeing Jesus must report it immediately so they could arrest him. 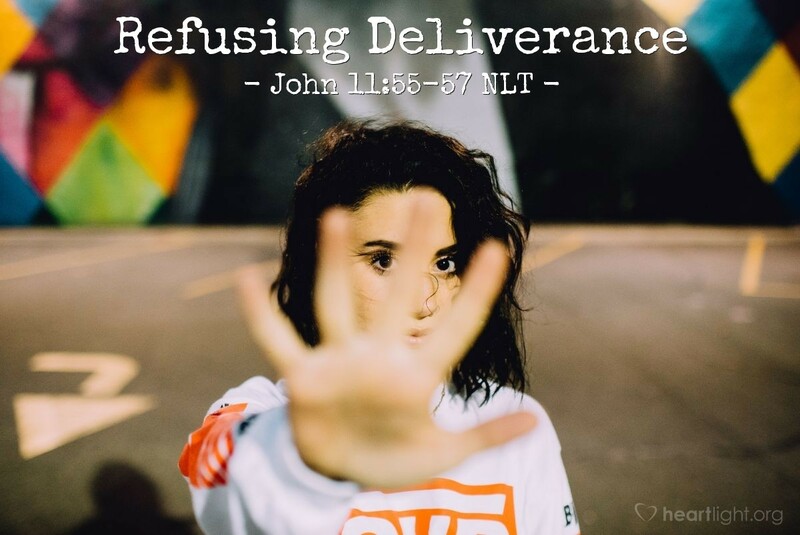 Why is it so hard for those caught up in wrong things — ideas, addictions, relationships — to accept the opportunity for deliverance? While there are many partial answers, there is one clear answer: Satan has blinded them to the truth because he doesn't want them to be free to choose. Despite the miraculous raising of Lazarus, some would not believe. Despite the freedom that Jesus came to offer, some would not receive it. In fact, some were determined to be rid of Jesus because they were happily settled in the fog Satan had brought over them to keep them from the truth. As much as we may pray and try to convince people about Jesus, some will not believe. There is not much that we can do other than to pray for their hearts to change, live before them with a consistent example of character and faith, and be ready to help when they face difficulty or find themselves open to the truth. Father, please minister to my discouragement. I have some friends whom I love deeply who are caught in Satan's traps. Make my life a consistent example of compassion and character before them. Please help me see the opportunities when these friends are more open to your grace, and please use me to share that grace at the appropriate time. In Jesus' name, I pray. Amen.